May be taken when radial pulse is not present or is difficult to palpate (OER #1). Ask the client to sit upright. 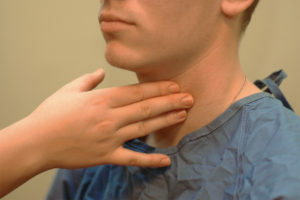 Locate the carotid artery medial to the sternomastoid muscle (between the muscle and the trachea at the level of the cricoid cartilage, which is in the middle third of the neck). With the pads of your three fingers, gently palpate the carotid artery, one at a time. See Figure 3.3 for correct placement of fingers. Although other pulses can be taken simultaneously to assess equality, the carotid pulses are NEVER taken at the same time. Gently palpate one artery at a time so that you do not stimulate the vagus nerve and compromise arterial blood flow to the brain. Avoid palpating the upper third of the neck, because this is where the carotid sinus area is located. You want to avoid pressure on the carotid sinus area because this can lead to vagal stimulation, which can slow the heart rate, particularly in older adults. Never palpate the carotid pulses simultaneously as this will reduce and/or compromise cerebral blood flow. Carotid Pulse by Ryerson University is licensed under a Creative Commons Attribution 4.0 International License, except where otherwise noted.